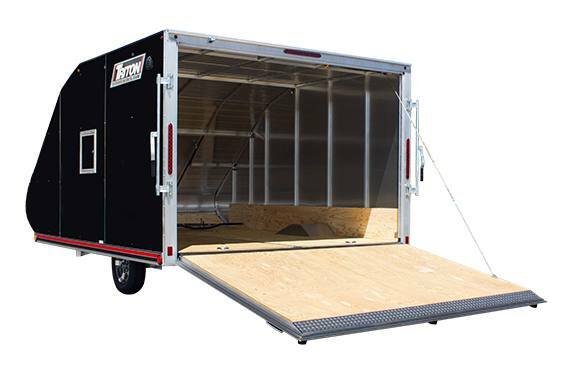 A cross between a trailer cap and enclosed trailer, these sleek, lightweight and aerodynamic Triton TC trailers combine the best of our Coverall models with the benefits of a fully enclosed trailer. Features include an all-aluminum, full-tubular frame with a rear drop down ramp and torsion axles. Interior wood kick panel protects your equipment. Full-length reflective decals for better road visibility. Flexible plastic bridge between ramp door and deck to keep hinge area free of debris and ice. Full-width drip rail over rear ramp door. 2 full or partial (depending on model) deck length Quickslide™ tiedown channels welded to the framing provide tiedown flexibility. w/o Brakes: 2025 lb. ; w/Brakes: 2030 lb. w/o Brakes: 2995 lb. ; w/Brakes: 3000 lb.